Chianti Classico Capotondo 2014 – Score 90 in Wine Enthusiast wine magazine (USA): “Aromas of wild cherry, raspberry, rose, grilled herb and a balsamic note follow through to the firm palate along with fresh mint and orange zest. Fine-grained tannins and fresh acidity support the juicy flavors”. concentrated in August. This heat has helped to create wines full of body, exalting perfumes and floral scents. The harvest was excellent, thanks to the high temperatures all the vineyards reached perfect ripening. Harvest began on the 1st October and ended on the 26th October, with separate harvest to achieve the best from each cru. The grapes are collected and carefully selected. Maceration is medium duration and lasts for 25/30 days. The wine is then placed in steel tanks until the month of December, after which it takes a step into a large barrel and barrique of third or fourth ride for 10-12 months, allowing for the ripening of tannins. It follows an ageing in bottle for 8 months. Red colour laden with pleasant purple tones. Good body, good acidity and freshness, with prevailing floral notes, hints of red rose and violet. The scents of red fruits prevail, with mature fruit trends as the red fruit, blueberry, cherry and plum, slightly spicy. A wine of great harmony, typical and balanced, of great character. A distinguished personality that exalts the altitude of Castelvecchi, situated between 400 and 600 meters above sea level. A wine that promises to evolve sublime over time, expressing a great longevity. Perfect for all meals, great drinkability. 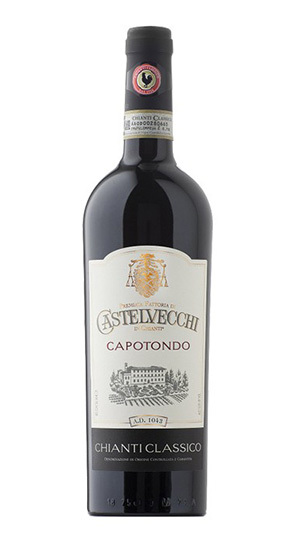 Try Chianti Classico Capotondo pairing with Fettuccine Alfredo, find the recipe here!